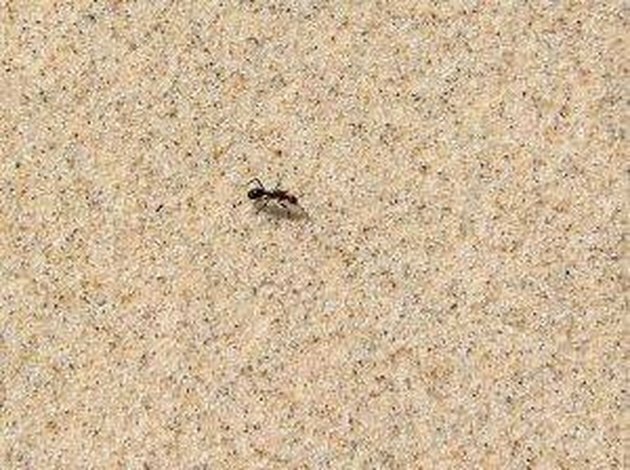 Ants are a nuisance anywhere they are found, but they can be especially hard to extricate from sand. There are a number of ant repellents that you can make out of items you already have on hand. Cinnamon, chili powder, baking soda and peppermint are all known to repel ants. Borax is also an alternative to dangerous pesticides. Mix one part ground cinnamon, one part baking soda and one part chili powder in a small mixing bowl. Sprinkle the mixture around the perimeter of the sand. All three of these are ant repellents and the ants will almost never cross the boundary you've created. Combine 15 to 20 drops of peppermint extract with water in a plastic spray bottle. Shake well before each use. Spray the mixture over the path of the ants, as well as over the sand that the ants inhabit. Peppermint is a powerful natural ant repellent, and sand ants will avoid it at all costs. Mix one part borax with one part icing sugar and pour the mixture into small bowls. Place the bowls in sand the ants inhabit. The icing sugar will draw the ants, and they will take the mixture back to their den as food. When they feed the borax to their queen, it will kill her, and the ants will eventually die off.